Even This invites readers to make room for daily personal experiences with God. From the very first page readers will walk down a spiritual path meant to remind each of us that God will meet us in the unexpected, bringing His goodness, giving us cause to trust, reminding us of His capacity. 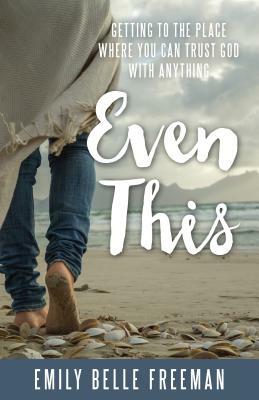 Filled with deeply personal stories about holding onto belief, daring to trust, and longing for understanding, Even This chronicles one woman's quest to find God in the everyday moments-with one of the most powerful experiences taking place as she searches for sea shells while walking on the beach-and provides many opportunities for individual introspection. "Yes, God is good and He can be trusted," Freeman concludes, "and it is the daily discovery of these truths that has the potential to become the greatest journey of a life and lead us closer to Him." Stop letting fear dictate the depth of your belief through simple daily reflections that will restore your confidence in God. Let go of your need to control by discovering what is holding you back from being completely vulnerable in your relationship with God. Learn how to trust that God may have something entirely different in mind than you could ever anticipate--something better. Emily Belle Freeman is a popular inspirational speaker. She co-authors a blog about putting faith into everyday acts at www.multiplygoodness.com. She is a wife and mother of four.